What’s a cook-along? For the Accidental Locavore it’s a chance to use some of the many cookbooks I’ve collected over the years. Most of them have in fact been opened, but probably the majority have never been cooked from. So this year, inspired by French Fridays with Dorrie, I’ve decided once a week, to break open one of the cookbooks, and cook from a variety of recipes, and I’d like you to cook-along with me. The books that seem most interesting will stay in the collection, the others will be deaccessioned to make room for future objects of lust and hunger. 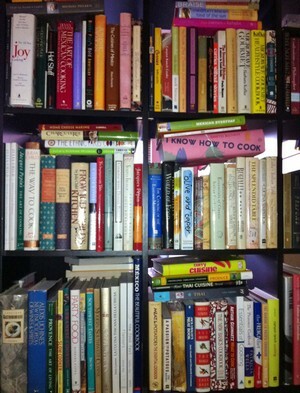 For January, the criteria for choosing books for the cook-along is going to be heft. Heft? Hey, it’s January and everyone wants to loose some weight, even if it’s just from the bookshelf… Since there are only a few of the really enormous tomes, for next month I’ll put up a poll and let you vote for the February books. If the cookbooks in the cook-along seem interesting, you like the recipe we do, want to get a head start, and you want to buy the books, there will be links on the site to Amazon. Otherwise, every Friday, I’ll post my adaptation of the recipe with notes and ratings after cooking it during the week. The first post for the cook-along was last Friday, a recipe for chicken tagine from Claudia Rodin’s Arabesque (OK, not a mammoth cookbook, just piqued my interest). This week we’re moving to a much bigger book, Thomas Keller’s Bouchon. There was an interesting article in the December Food & Wine Magazine about learning to cook from cookbooks, and he mentions Bouchon as one of his go-to books. Obviously a much stronger guy than I am, however I did manage to haul up the book, and there are a lot of interesting ideas in it. This week, let’s try the Duck Confit with Brussels Sprouts. This might take a little advance preparation, as it calls for both duck and garlic confit. I’ve got both, the duck courtesy of Hudson Valley Fois Gras, and the garlic confit I made earlier. So are you ready to cook-along? Let me know what you think, or when you want to come for dinner.